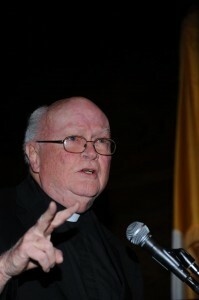 Father William Byron, S.J., accepted the Barry Award from the American Catholic Historical Society Nov. 16. Cicero said it best. “The first law of history is to not dare to tell a lie and not fear to tell the truth.” Pope Leo XIII quoted this in 1881 when he opened the Vatican Archives for scholarly research. The American Catholic Historical Society was founded in Philadelphia three years later and has striven to be true to this dictum ever since. Rodger Van Allen, the society’s 52nd president, also made reference to this famous quote at its annual Commodore John Barry Award Dinner held Nov. 16 at the Union League of Philadelphia. The American Catholic Historical Society is one of the most distinguished Catholic organizations in the field of history and this year’s honoree, Jesuit Father William J. Byron, is clearly among the most distinguished Catholics in the field of education. He has been president of two Catholic universities — the University of Scranton (1975-82) and the Catholic University of America — and also his alma mater, St. Joseph’s Preparatory School. Along the way he has garnered 25 honorary degrees and is currently University Professor of Business and Society at St. Joseph’s University. Father Byron was born in the Pittsburgh area but raised in Germantown, Philadelphia along with his younger brother after his mother was widowed when he was only 2. He was just a freshman at St. Joseph’s Prep when World War II broke out. Knowing he would be drafted upon graduation, he went to the registrar at then-St. Joseph’s College in his senior year to have his name put on the list, because he also knew there would be a huge number of men wanting to attend college after the war. As expected, he was indeed drafted into the U.S. Army, but volunteered to train as a parachutist. This was a dangerous choice because the parachute regiments had among the highest casualties in the war. But he was very young and very patriotic. Possibly fortunately for Catholic education the war ended while he was still in training and he finished his tour of duty in occupied Germany. As he expected when he arrived at St. Joseph’s there were many other young men entering. He stayed three years and then he entered the Jesuits where he finished his education and the rest is history. At that time, he recalled the G.I. Bill paid $500 for tuition, fees and books, a fair sum at the time, and the bookstore might throw in extra pads and pencils to spend the full sum. “Today you couldn’t buy the books for that,” he said. Students also received $75 a month for living expenses, $120 if they were married. Father Byron did not see any major innovative ideas coming out of the recent election, but can suggest one himself. “A really big idea would be to try to institute a form of national service to give young men and women who participate an opportunity to enter one of the great places like St. Joseph’s, Villanova, La Salle, Cabrini, Gwynedd Mercy,” he said. Father Byron has a point. Now, if only Congress would listen. PREVIOUS: New website promotes Catholic adoptions in Pa.